Courtesy of BBC, Ulster, Northern Ireland. Attila Mányoki attempt to cross the North Channel between Northern Ireland and Scotland and complete the fastest cumulative time of the Oceans Seven ended in his admittance in the intensive care unit at the Ulster Hospital, Northern Ireland. Worries reigned for the International Marathon Swimming Hall of Famer from Hungary [shown above with Monika Pais]. After a week in the hospital, word leaked out that he was getting better, but his friends and fans continue to worry because his second attempt of the North Channel seemed even more at risk than his 2015 DNF where he was pulled unconscious from the same body of water. 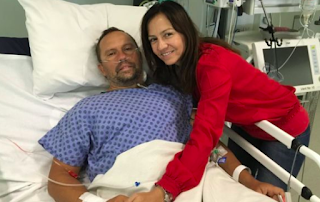 Fortunately, Ulster Hospital consultant Dr Bob Darling told the BBC that "[Attila] is not an average guy, he is very strong and fit and is making a remarkable recovery, although it may be some time before he is fit for further extreme sports." Today's first-hand interview with Attila can be heard on Hungarian Rádió1 here.